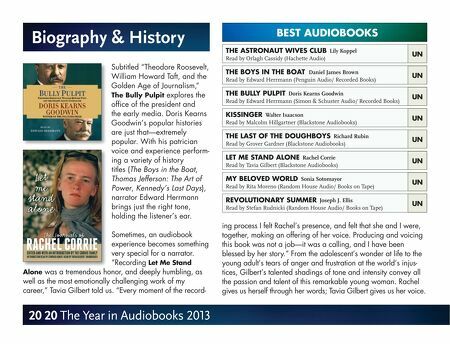 Biography & History BEST AUDIOBOOKS THE ASTRONAUT WIVES CLUB Lily Koppel Read by Orlagh Cassidy (Hachette Audio) Subtitled "Theodore Roosevelt, William Howard Taft, and the Golden Age of Journalism," The Bully Pulpit explores the office of the president and the early media. Doris Kearns Goodwin's popular histories are just that—extremely popular. With his patrician voice and experience performing a variety of history titles (The Boys in the Boat, Thomas Jefferson: The Art of Power, Kennedy's Last Days), narrator Edward Herrmann brings just the right tone, holding the listener's ear. Sometimes, an audiobook experience becomes something very special for a narrator. "Recording Let Me Stand Alone was a tremendous honor, and deeply humbling, as well as the most emotionally challenging work of my career," Tavia Gilbert told us. "Every moment of the record- 20 20 The Year in Audiobooks 2013 THE BOYS IN THE BOAT Daniel James Brown UN Read by Edward Herrmann (Penguin Audio/ Recorded Books) UN THE BULLY PULPIT Doris Kearns Goodwin Read by Edward Herrmann (Simon & Schuster Audio/ Recorded Books) UN KISSINGER Walter Isaacson Read by Malcolm Hillgartner (Blackstone Audiobooks) UN THE LAST OF THE DOUGHBOYS Richard Rubin Read by Grover Gardner (Blackstone Audiobooks) UN LET ME STAND ALONE Rachel Corrie Read by Tavia Gilbert (Blackstone Audiobooks) UN MY BELOVED WORLD Sonia Sotomayor Read by Rita Moreno (Random House Audio/ Books on Tape) UN REVOLUTIONARY SUMMER Joseph J. Ellis Read by Stefan Rudnicki (Random House Audio/ Books on Tape) UN ing process I felt Rachel's presence, and felt that she and I were, together, making an offering of her voice. Producing and voicing this book was not a job—it was a calling, and I have been blessed by her story." From the adolescent's wonder at life to the young adult's tears of anger and frustration at the world's injustices, Gilbert's talented shadings of tone and intensity convey all the passion and talent of this remarkable young woman. Rachel gives us herself through her words; Tavia Gilbert gives us her voice.